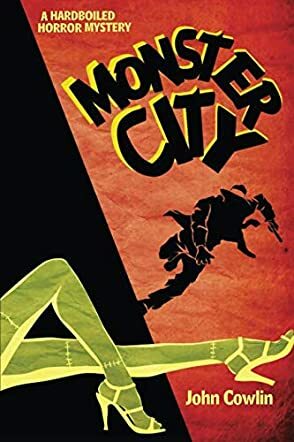 Monster City by John Cowlin is a fascinating sleuth mystery written with a twist. It is a story of monsters. It is a story of murders committed in a city of monsters where zombies keep the streets clean. It is the story of Vic Brahm, a very busy private eye. His partner, Shelley, has been murdered and Vic has made it his business to find the killer. A three-thousand-year-old reincarnated mummy has hired Vic to spy on his newly constructed wife to find out if she is cheating on him. Jerry, a monstrous Sasquatch and Vic's old partner in the police force, has stopped by and asked Vic for some help with the Riding Hood murders. It appears that a wolf-man is murdering both vamps and females wearing red, no matter what phase the moon is in. Vic has to search through the city, battling voodoo priests, gypsies, zombies, vampires, and assorted other monsters to find answers for his cases. The question is: will he succeed in helping any of his clients or will the monsters of the city make him their next victim? Monster City by John Cowlin is a riveting sleuth mystery set in a city of monsters. Once you start reading it, you won't be able to put it down. John Cowlin has created an incredible story world where breakfast is served at dusk and the city wakes up with the rising of the moon. Monsters may seem a little frightening, but according to Vic, the real monsters don't reside in Monstruo. The real monsters live outside the city where the normals reside. The more you get to know the characters and the inhabitants of Monstruo, the more you understand the definition of what a true monster is. There is an unexpected twist at the end that I should have seen coming, but I was so caught up in the story that I missed all the clues. This is a great book and I recommend it for all those who like monsters mingling with detective mysteries. A word of caution, though, this book contains some very strong language and some sexual content, and is suitable for a more mature reader.